As I write this, it's breakfast time here in the U.K. I'm having some coffee, a satsuma and half a chicken. The cornerstone of any nutritious breakfast, as The Man once said. I am reminded, however, of this weekend's splatfest, taking place on Switch shooter Splatoon 2. Indeed, the topic of discussion this time covers The Most Important Meal of the Day, (or so I had drummed into me as a youth). Rap-rock duo Off the Hook want to know whether, when it comes to breakfast, you prefer Pancakes or Waffles, despite them not being particularly different foodstuffs, really. 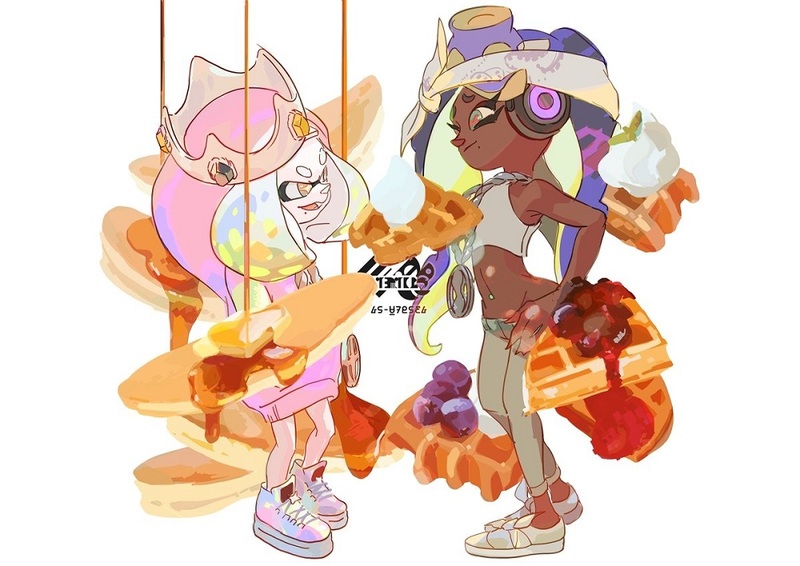 Pearl will be in the corner of Pancakes, while her bestie Marina prefers the slightly more overdone texture of a good Waffle. In either case, I hope they're being served with maple syrup and banana. That's a good combo, friend, try it this weekend. The breakfast splatfest will take place across North America and Europe. It begins tonight at 20:00 PT / 23:00 ET in North America until the same time tomorrow. In Europe, the splatfest will run from 15:00 BST until the same time Sunday. Good luck, squid kids!